Bed and breakfast in keswick b&b, Fell House, built in circa 1884, is a warm and friendly Victorian Lakeland House with lots of charm, located in the beautiful North Lake District town of Keswick and, has retained many of it's original features, including pitch pine staircase and doors, and in the breakfast room, a white marble fire place complete with copper canopy made by Keswick Industrial Arts. CAR PARKING in Keswick can be a problem, so we are pleased to offer free private off street parking at the rear of the house. We are ideally situated in a elevated position, in a cul-de-sac, which is quiet at night, yet only 2 minutes walk from Keswick Town centre, shops, pubs, cafes, restaurants, parks, Keswick Theatre by the Lake, Keswick pencil museum, and not forgetting Derwentwater, The Queen of the Lakes, a little further out of town is Castlerigg Stone Circle, over 5000 years old. At Fell House we take pride in our high standards of cleanliness and Visit England annual assessment inspectors awarded our hard work with the prestigious 4 star "SILVER AWARD" this is also highly appreciated by our visitors who return again and again, also awarded 5 out of 5 on Food Hygiene Rating from the Food Standards Agency. 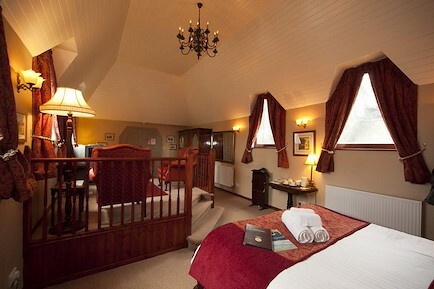 The bedrooms are well decorated and have co-ordinated soft furnishings. Fell House comprises five bedrooms, providing options of a twin or double En-Suites, or for those on a budget we have a double economy with private bathroom. Each room has flat screen TV, tea and coffee making facilities, a fully stocked beverage tray, central heating you can control and wonderful Fell views. In the spacious breakfast room you will be served with a hearty English breakfast using only the finest local produce to set you up for the day ahead,.... we also offer lighter options, and vegetarians are well catered for. Drying wet gear....There are limited drying facilities, however we do our best to help everyone. Your hosts Barbara and Colin offer a warm and friendly welcome, so whatever the reason for your visit to Keswick, we will try to make your stay at Fell House really special, and we are very happy to share our local knowledge of things to see and do. On arrival you will be given your own key and you will be free to come and go as you please. Sorry we are unable to accommodate children. Sorry we are unable to accommodate pets, this is ideal accommodation for those with pet allergies. Please click on make an enquiry and book via Fell House and we will donate to the North Air Ambulance. By road:- At Junction 40 of the M6, travel west along the A66 until you reach the second roundabout[approx 17miles]. Ignore any signs for Keswick before this. Turn left and follow the road to a T junction and turn left again. After 400 yards go straight over the mini roundabout and Stanger Street is then 50 yards on the left. By Rail :- The nearest main line station is Penrith where you pick up a bus connection for Keswick just outside the station entrance. Fell House is a 2 minute walk from Keswick bus station, (Booths Super Market). Your enquiry will be sent directly to Fell House. Please fill in as much detail as you can.